The market for social bonds climbed 41 percent to $11.1 billion last year, according to BloombergNEF research. 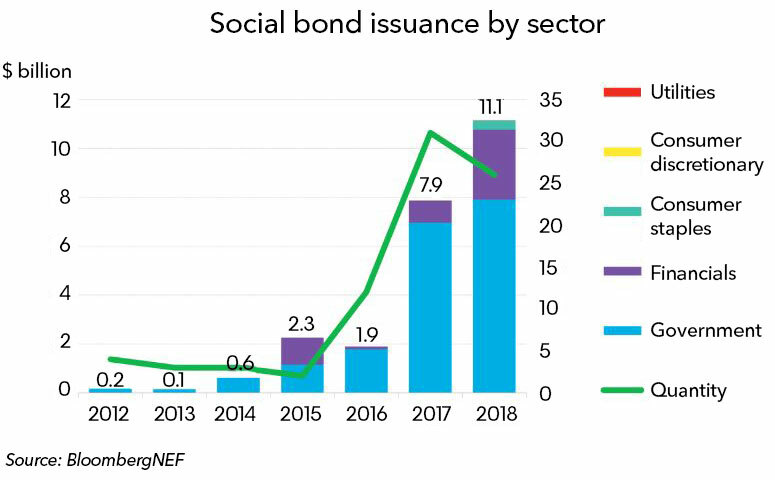 Individual issuances were larger than in 2017, while there was a drop in the overall number of transactions, with just 26 social bonds on offer – five fewer than the previous year. Government was the biggest issuer, accounting for 70 percent of the bonds, followed by the financial sector, with 26 percent. Financial institutions more than doubled their issuance from 2017, helped by Groupe BPCE, which made up half the total with a 1.25 billion-euro ($1.46 billion) social bond. Social Bonds are use-of-proceeds bonds that raise funds for projects with positive social outcomes as defined by the International Capital Market Association. In 2017, this organization published the first edition of the Social Bond Principles. BNEF clients can access the full report, Sustainable Finance Market Outlook 1H 2019, on the Terminal or on web.